In webOS 1.0, there was an autocorrect dictionary that would fix typos as you typed, but there was no way for the user to access or edit that dictionary, no visual or auditory notification when your text was autocorrected, and no other suggestions for misspelled words. In webOS 2.0, the way autocorrection works got a major overhaul to address those deficiencies. 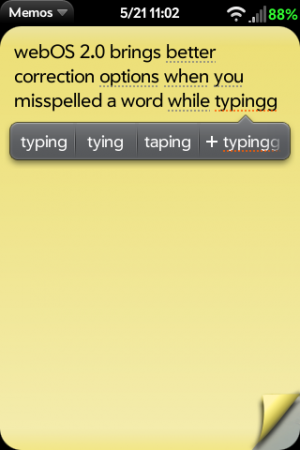 Just as in webOS 1.0, you can immediately press the backspace key ( ) to undo the autocorrect. If the word is not in the dictionary and there is no defined autocorrect (or you undid the autocorrection), the word will get a red dotted underline. Tapping on a red underlined word will also cause a pop-up to appear, but this pop-up will provide a list of suggestions for the mistyped word. If the word you want is there (you may need to scroll to the right), just tap on it to replace the typo. Text Assist will actually look through the first and last names of your contacts. This will also prevent contact names from being identified as a misspelled word and may even initiate an autocorrection if a typo is close to a name in your contact list.